Today was such a lovely, fun-filled day that it's practically completely made up for the difficulties we've endured this past week. While it did get just a tad uncomfortably warm at midday, there has been an impressive breeze that is still chasing around the house with such speed and agility that I have a chill on my skin as I type this. While the day began as lazily as all of the others before it, I was feeling so refreshed by the late afternoon that I realized I might realistically meet my goal of making it out into the ocean before we leave this place. And since we have plans to visit nearby family tomorrow, today was my last chance. I started prepping the kids around 3:30, wrangling them each into a pair of Little Swimmers and baby swimsuits. 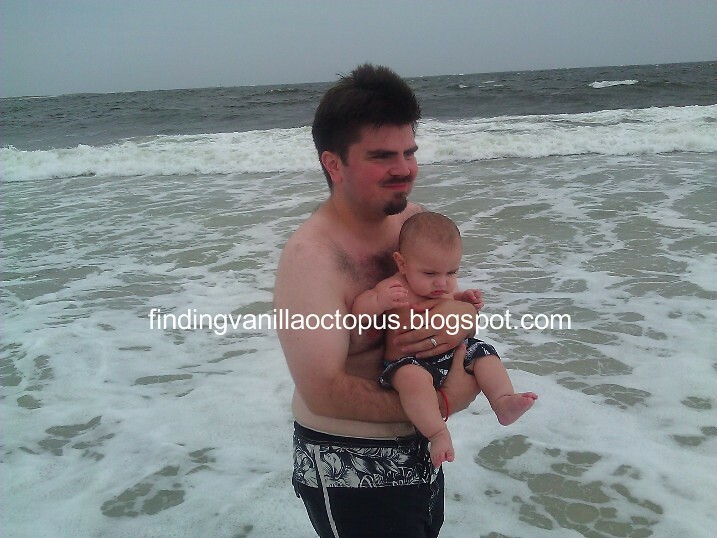 Then Tom and I grabbed a few towels, a little folding chair, and our phones, and set off to the beach with the babies in-tow. Literally. I was a little nervous about putting Michael in the wagon, but I stayed within arms-reach of him the whole time, and he did well. I spotted him over bumps and on inclines, but he's gotten quite good at sitting up, and otherwise needed no help from me. Except for the couple of occasions in which Abby got a little too excited and tried to smother him with sisterly love. Being currently camera-less, I took all of these photos with my phone's camera. I was pleasantly surprised at how well they turned out, considering. 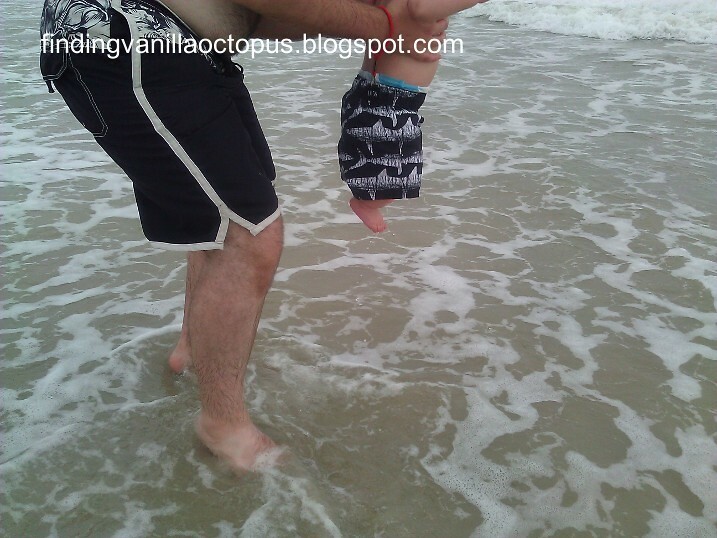 Michael has had a walk or two along the beach with Tom prior to today, but this was his first actual ocean experience. 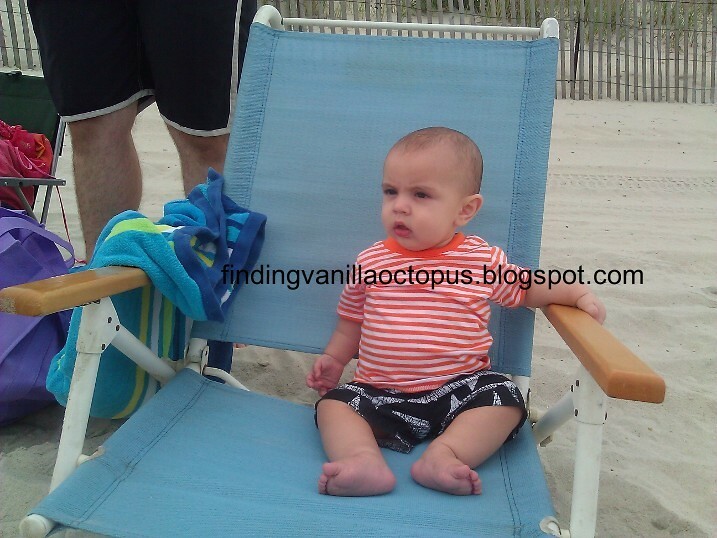 Here he is, taking in the scene from the beach chair I set him down on when we first arrived. Unfortunately, he was not a fan of the wet sand at the shoreline. And he wasn't too keen on the idea of dipping his toes in the approaching tide. He was much happier back in the safety of Daddy's arms. Abby wasn't interested in the water today, either. She stayed up at the chairs with Great-Aunt Marcia and Great-Uncle Richard. I brought Michael back up to join them, and returned to the shoreline, where Tom had gotten into the water ahead of me. The water temperature was perfect. But the waves were pretty fierce. A younger version of myself would have taken them as quite the challenge, but I was out-of-practice with my wave-jumping skills, and kept getting caught in the undertow as I tried to catch up with Tom. Even once I made it out to wading depth, and got a handle on how to approach each coming wave, I was still occasionally being grabbed by the waves, tossed and shaken like a rag doll in a salty, underwater, roller coaster. Not for the first time, I really began to feel my age. While perhaps a decade ago I would have lasted thirty minutes or more in worse conditions, I was ready to throw in the towel after less than ten today. When, after battling a particularly difficult wave and free-styling for several feet to make up for the drifting I'd done away from our spot on the beach, I began to feel a drastic dip in my energy levels, I knew that it was time to head to shore. I said as much to Tom, who admitted that he'd reached his limit as well. And the babies had had enough by then, anyway. Abby was softly whining as she sat on the sand, though she cheered up a bit when I put her pink cover-up over her bathing suit to help keep her warm. But she anxiously called out for Aunt Marcia when she made one last run into the ocean, and would not be soothed until Marcia returned. 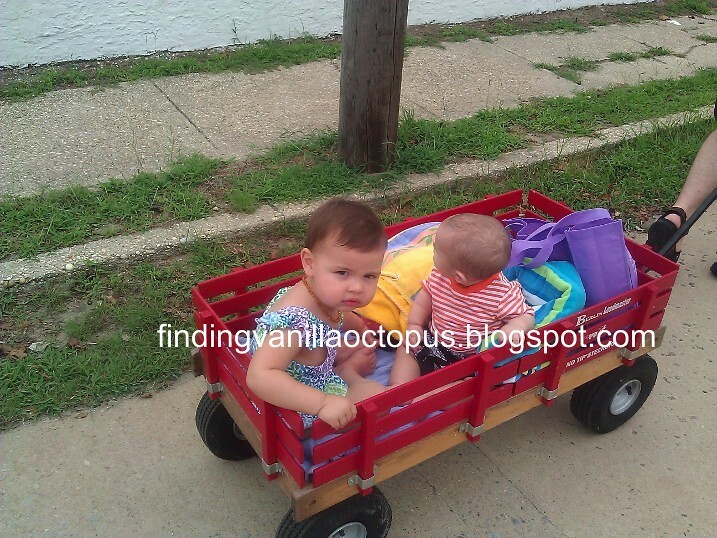 When she did return, Marcia scooped up Abby and headed back to the beach house with her. I met Tom on his way to our location with the wagon. Feeling too tired to even handle carrying Michael on the trip back, I handed him to Tom, and pulled our various things behind me in the wagon. I found Abby and Marcia playing in the yard, and joined them with Michael. This turned out to be a much better activity for the babies, far away from the powerful wind and overwhelming sounds of the ocean. Abby particularly enjoyed watering Marcia's feet. And making big splashes in the pool. She also, predictably, had to do what every baby must do at some point in their development: try to eat sand. I don't think she liked it much. But she did learn a new word: pebbles. Ever the observer, Michael had a blast taking in all of the action. He didn't even mind when he was hit with a stray spray of water, or two, or ten. And then, it was time to de-sandify the babies. I started with Abby, who had managed to find time to poop in her Little Swimmers. I had learned from Nana's hard lesson the other day (she began diligently scooping the pile of "sand" that had mysteriously collected in the diaper out onto the floor of the shower, only to realize midway through the process that it was not, in fact, sand) not to reach down into the diaper without looking. However, I wasn't particularly graceful in my attempts to remove it, and the contents fell with an unceremonious plop down onto that same shower floor before I could make a move to stop them. Thankfully, Marcia was close by to help, and removed the mess on the ground before the smell was able to completely overwhelm me, but I still had to take care of the mess on the baby. I was marginally successful. And then I had some fun with bleach when all was said and done. As we were preparing dinner, we heard a rumor that a parade would be coming through the streets of the community, so Marcia and I put the freshly-washed babies into the double stroller and went to check out the scene. It turns out that every six years, the fire department here hosts five others, and they hold a celebration in recognition of their contributions to the community (the other five years are spent rotating through the various other fire departments' home locations). So we were treated to a long procession of fire trucks, marching men and women in uniform, and marching bands. Abby especially loved the bands. And the sidewalk chalk that she found and colored with along the side of the road.